In recent years there's been a growing number of crime dramas obviously inspired by those of the 70's, particularly those from directors like Scorsese, and Coppola. They feature slower, more dramatic, character driven stories with action/chase sequences done with far less quick cutting than most other films today. 2013's "Blood Ties" is one of the fairly recent examples that comes to mind, and now there is J.C. Chandor's "A Most Violent Year." However, despite it's classic inspirations, this is a mostly middling affair. 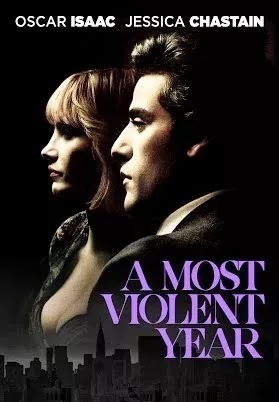 The title refers to the year 1981, the year the film is set, because it was statistically the most violent year in New York City history up till that year. That made it difficult for some to make a business in a particularly competitive market. Abel Morales (Oscar Isaac) is one of the men suffering during these tough times. He's a good man trying to realize the American dream in a difficult business full of men of questionable character. He owns an oil company that's been suffering from theft lately. One of his truck drivers has been attacked and his truck stolen for the precious oil it carries. On top of this Abel has just put down a deposit on a port property that will finally make his business complete. But he only has a short time to gather the remaining funds to buy the property. As the truck attacks becomes more prevalent, and he's forced to chase a gunman from his family home, the situation becomes more desperate. His wife Anna (Jessica Chastain), a gangster's daughter, supports him, yet she's torn between her respect for his moral uprightness, and her desire for him to protect the family and business at all costs. There are moments where it's clear that she's the tougher person who would willingly take violent matters into her own hands no matter the cost. What balances the couple out is Abel's desire to keep his family and his business above reproach, especially considering he's under near constant police surveillance. Jessica Chastain and Oscar Isaac are both actors enjoying a lot of success lately. They've been giving great performances in good films just about every time we see them lately, and they're both very good here. Sometimes actors are simply at their best when playing a version of themselves. They both seem to be finding roles that allow them to do that rather than playing off the wall characters. Despite being a version of himself, Isaac manages to create a different character than the ones he played in "Inside Llewyn Davis" and "Ex Machina." He manages a subtlety that hints at repressing violence throughout most of the film. Abel trains his young salesmen to always take the classier option (between tea and coffee, or lemonade and soda) in order to appear more sophisticated than their competitors. He tells them to maintain eye contact with a client longer than it feels comfortable to do so. "You'll never do anything as hard as staring someone in the eye and telling them the truth," he tells them. Chandor appears to aspire to make his film in a similar fashion, tending to linger on shots far longer than most directors nowadays would be willing to. Even in the films several chase sequences, rather than quick cuts there are long takes that successfully build tension by holding on a character a little longer than we expect. However, many viewers will find it slow. The overall aesthetic seems to be a mix of "The Godfather" and "The Conversation," however this film never quite rises to the level of either of these. Typically a film presents a character in need of change, someone who will undergo a journey to accomplish a goal and learn valuable lessons along the way. Here, Chandor presents a character working to achieve a goal while having the courage and strength of character not to change. I appreciate a film that can tell good story. I also appreciate a film that celebrates good films that came before it. However, if there is little ambition to set the film apart, it becomes a slight exercise in futility. In other words, "A Most Violent Year" is a solid, yet forgettable film with solid performances, that makes us wish we were watching the films that inspired it.